Homemade Triple Chocolate Brownies made with bittersweet chocolate, unsweetened chocolate, and cocoa powder which make the best rich, fudgey brownies you’ll ever eat. 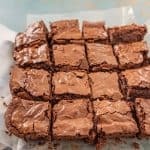 Here’s my go-to brownie recipe. I love that it uses butter and three types of chocolate – it tastes so decadent! There’s no double-boiler needed, and it’s so easy to make. I’ll be the first to admit that I have this recipe memorized and can whip it up in a flash. You can thank me after you make these because they are sure to become your favorite recipe, too. I’ve never really been a believer in homemade brownies. 99% of all homemade brownies I have tried are dry, cakey, and lacking in chocolate flavor. This, my friends, is the 1% of homemade brownies. Dark, rich, smooth, dense, and full of chocolate flavor. This recipe comes from the America’s Test Kitchen Family Baking Book. I am in love with their books and recipes and have tried tons of recipes all with great success, so when I saw this little gem I knew that it was worth trying. Use Dutch-process cocoa if you can. It makes the finished brownies nice and dark in color and gives them extra chocolate flavor (additional info on the difference below). You can get some on Amazon! I love a gooey, slightly under-baked brownie. Don’t under bake this recipe, though. The brownies will be very moist as it is. If you under bake, you’ll have raw brownie in the middle. Letting the brownies cool is the hardest part, but it makes all the difference when it comes time to cut them into squares. These brownies are very rich. Cutting the pan into 16 might seem like small portions, but a little goes a long way. 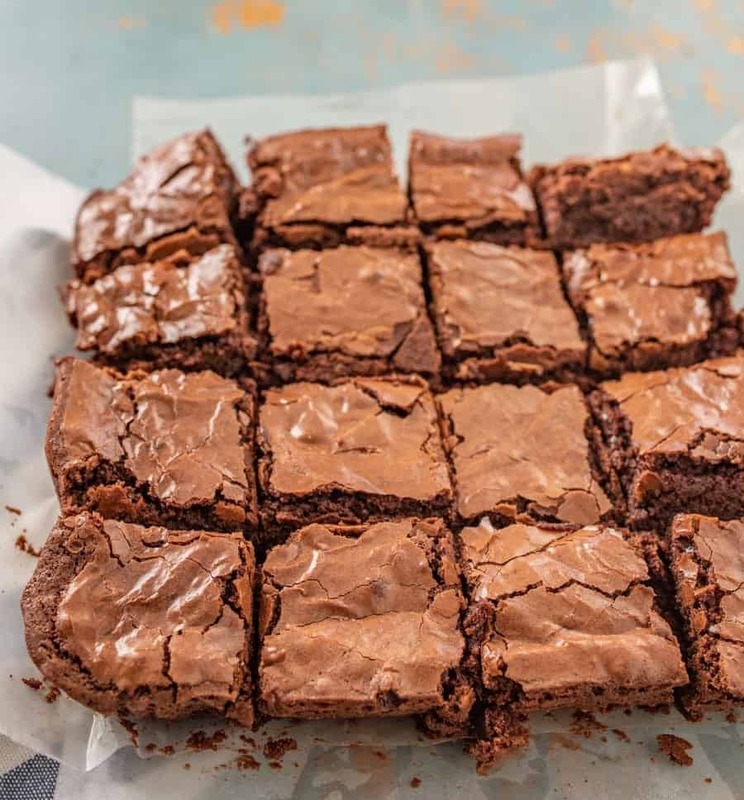 Can you freeze homemade chocolate brownies? Yes! They freeze great. 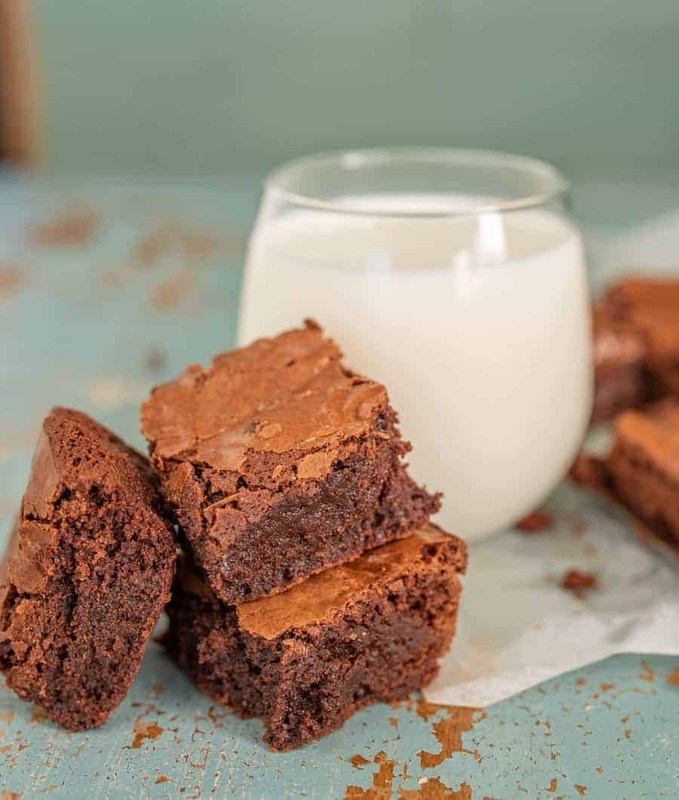 Just place cut brownies in an air-tight container and freeze for up to 2 months. If you are stacking the brownies in the container, you might want to layer them with parchment paper so that they don’t stick together. What’s the difference between traditional cocoa and dutch-process cocoa? Dutch-process cocoa is my favorite. The cocoa nibs are washed in a potassium solution to neutralize the acidity. This step is skipped when it comes to natural or traditional cocoa. Dutch-process cocoa powder has a darker color and more complex flavor and it is pH neutral. Natural cocoa powder tends to have a redder, lighter color and a fruitier flavor profile and is acidic. Dutch-process cocoa isn’t hard to find and is about the same price as traditional, so when a recipe calls for it, try to use it. It makes the finished baking product a darker color with a richer cocoa flavor. Homemade Triple Chocolate Brownies made with bittersweet chocolate, unsweetened chocolate, and cocoa powder which make rich, fudgey brownies you’ll make again and again. Preheat the oven to 350 degrees. Line an 8-inch square baking pan with foil and grease the foil and edges of the pan. In a microwave-safe dish (2-cup glass measuring cup works great for this), add your chocolates, cocoa, and butter. Microwave, stirring often, for 1 to 3 minutes until the mixture is smooth. In a large bowl, whisk the sugar, eggs, vanilla, and salt together. Whisk in the melted chocolate mixture until combined. Stir in the flour until just incorporated. 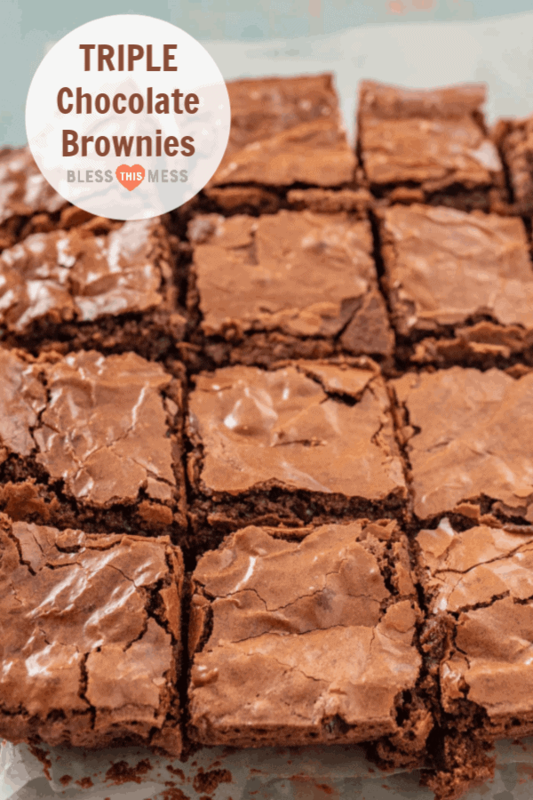 Bake the brownies until a toothpick inserted into the middle comes with just a few soft crumbs attached, 35 to 40 minutes. Let the brownies cool completely in the pan; set on a wire rack. 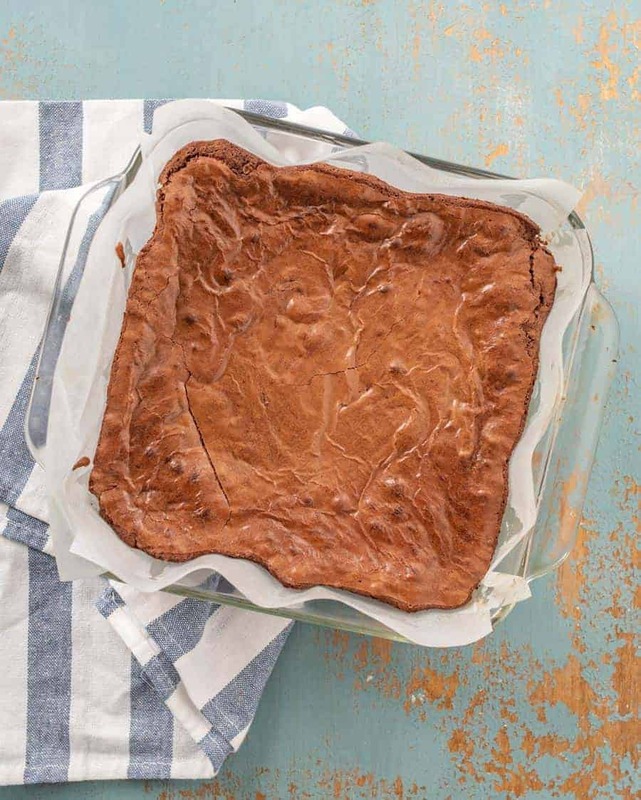 Remove the brownies from the pan, cut into squares, and enjoy. Use Dutch-process cocoa if you can. It makes the finished brownies nice and dark in color and gives them extra chocolate flavor (additional info on the difference below). I love a gooey, slightly under-baked brownie. Don’t under bake this recipe, though. The brownies will be very moist as the recipe it is. If you under bake, you’ll have raw brownie in the middle. Love chocolate brownies? Here’s a few other chocolate recipes you’ll love! Enjoy this chocolatey treat from my kitchen to yours! 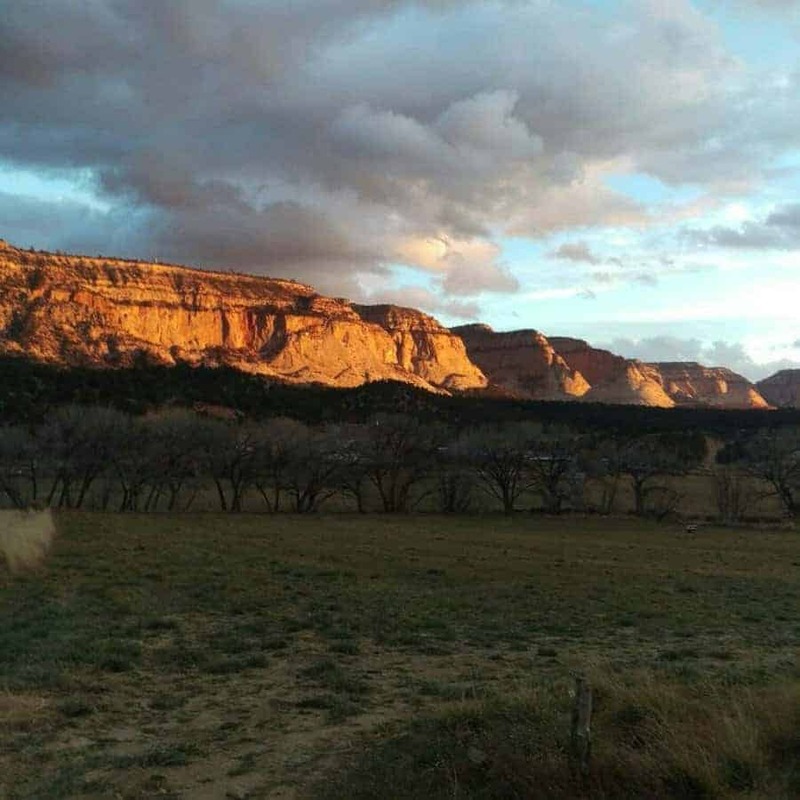 Sunset from the back porch. It just doesn’t get old. I’m shocked that ATK uses the microwave. Sad really. In the cookbook it explains that they were working for a recipe that would be just as quick and easy as a box mix but a million times better… I think that’s where the microwave comes in, the ease of it. Have you used their slow cooker book? They use the microwave in that book a lot more than others too. I’m always surprised when they do it too! Thank you – nice recipe. Triple chocolate….I’m all in!!!!! PS….these won’t freeze well either…they don’t like to be frozen….they like to be eaten as fast as possible!!!!! Luckily I am in the city tonight and can hit the big grocery store on the way home! I know what I am making in a couple of days!!!!! Thanks!!!! I can’t wait for you to love these as much as I do! !